The Kamaz truck of Andrey Karginov, Andrey Mokeev and Igor Leonov during the fourth stage of the Dakar Rally. As a group of spectators in the path of a Dakar Rally truck competitor ran to get out of the way over the weekend, one tripped and fell in the sand. The truck ran over the spectator’s leg while its driver, who said he didn’t know it happened, was later disqualified from the rally for not stopping to attend to the person. The nearly two-week Dakar Rally can be dangerous, and even fatal, whether or not people are operating within the rules. Motorsport.com reports that during the fifth stage of the rally on Friday, a group of five spectators were watching from outside of a stage’s designated spectator areas amongst some sand dunes. That’s when the truck of Kamaz driver Andrey Karginov drove into the picture, with the group standing right in his path. Video footage from the stage shows Karginov keep bouncing over the dunes as one of the spectators appears to trip, with the huge, boxy truck running right over the person’s leg. There’s video footage of the whole incident, but, be advised, it shows one of the spectators being run over without any edits. The video is shot from far away and it isn’t too graphic, but as we said, be advised, it shows a dude getting run over. 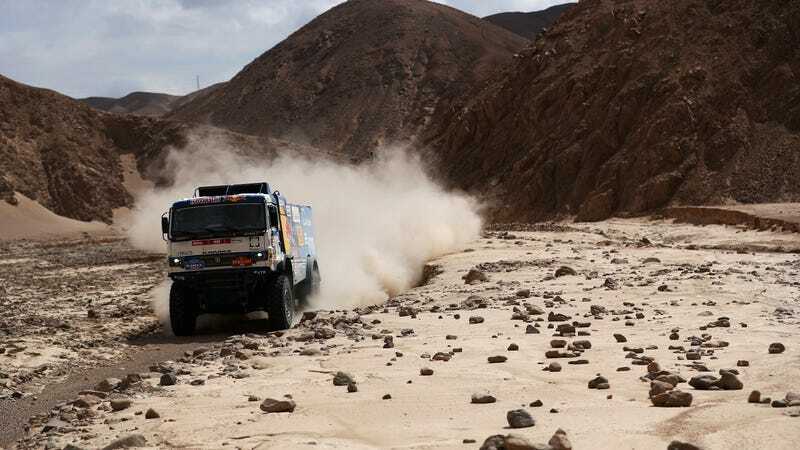 Motorsport.com reported on Saturday that event organizers said the spectator went to a nearby hospital in the Peruvian city of Arequipa with a broken femur, and that Karginov, a former Dakar trucks winner who was in third overall at the time, had been disqualified. “There’s a lot spectators on the route, and in the most difficult parts there’s always particularly many of them, spread out in various groups,” Chagin said. “As he [Karginov] was driving up one of the ascents, there was a group of five spectators in the path of the truck. Four managed to clear off but one tripped in the sand and his leg was caught under the rear wheel of the truck. Chagin said the team was surprised by the decision but can’t protest until the race is over, so they’re accepting it and moving on with their other teams. Karginov did check on the spectator after his race ended, though, with the Kamaz team’s Twitter account posting this photo of him, Chagin and team doctor Irina Zelenkova with the spectator while he recovered. Attending races is a great way to spend time, as this spectator obviously knows. But, especially if the race you’re attending can be particularly dangerous, try not to wander from the designated viewing areas. They’re designated for a reason.